The world's largest wind turbine is set to be tested in ‘extreme conditions’ off the coast of Britain in 2020. 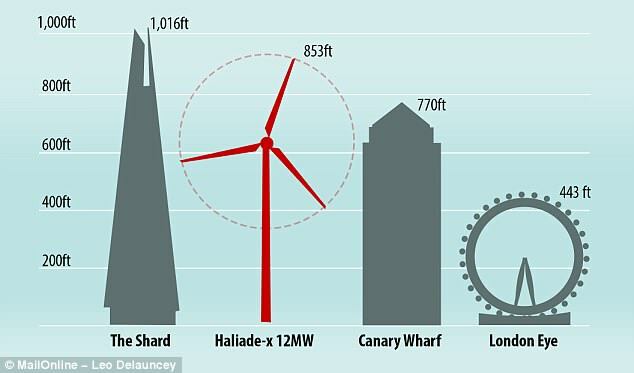 At 853ft from base to the top of its rotor, the turbine is taller than the One Canada Square office block at Canary Wharf, in London - which is 774ft high. It has a diameter longer than two football pitches and is more than two and a half times taller than Big Ben. It will also be the most powerful in the world - its 12 megawatt output will be able to generate clean power for 16,000 homes. 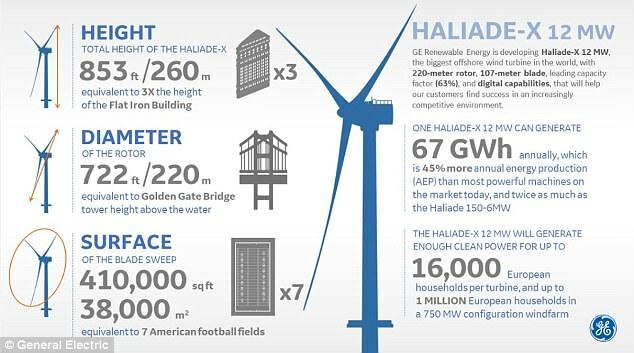 Manufacturer General Electric has signed a five-year agreement with the government to test the turbine, called Haliade-X 12, off Blyth, Northumberland. The turbine is nearly 150ft taller than the largest wind turbines currently in operation, installed at Vattenfall’s windfarm off the coast of Aberdeen, Scotland, which are 626ft high and generates 9 megawatts. 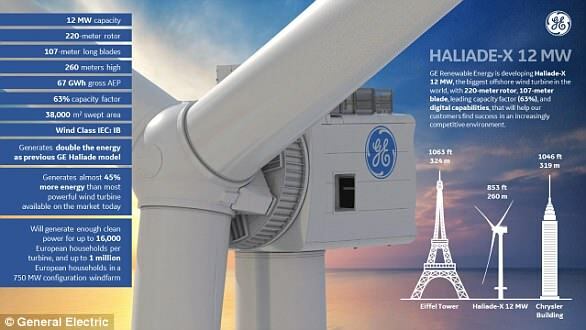 GE believes its 350 foot (106 metres) turbines will improve efficiency by producing more power from lower wind speeds through its mammoth wingspan. WHAT ARE THE SPECIFICATIONS OF THE HALIADE-X ? 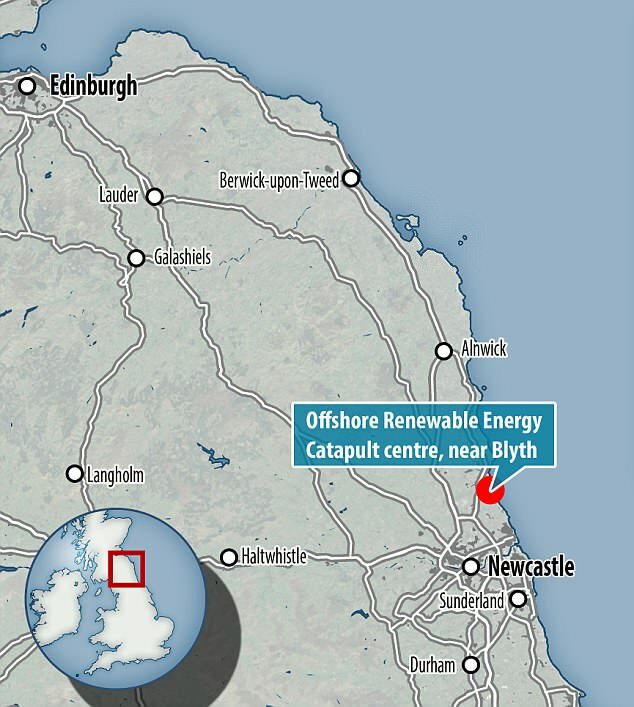 Britain’s energy and clean growth minister Claire Perry welcomed the agreement and said it highlights Britain’s world class research and testing facilities at the Offshore Renewable Energy Catapult in Blyth, where new power technologies are tested. The agreement also includes a £6million ($8.3 million) combined investment from Britain’s Innovate UK and the European Regional Development Fund (ERDF) to install the world’s largest and most powerful grid emulation system at the Catapult’s Blyth centre. The UK gets around a quarter of all wind power investment made across Europe. To understand what makes the wind blow, we first need to understand what atmospheric pressure is. Pressure at the earth's surface is a measure of the 'weight' of air pressing down on it. The greater the mass of air above us, the higher the pressure we feel, and vice-versa. The importance of this is that air at the surface will want to move from high to low pressure to equalise the difference, which is what we know as wind. So wind is caused by differences in atmospheric pressure - but why do we get these differences? It's down to the rising and sinking of air in the atmosphere. Where air is rising we see lower pressure at the earth's surface, and where it's sinking we see higher pressure. In fact, if it weren't for this rising and sinking motion in the atmosphere then not only would we have no wind but we'd also have no weather. This rising and sinking of air in the atmosphere takes place both on a global scale and a local scale.